If you work at ABC News, today is a day that you ought to be ashamed of your career. 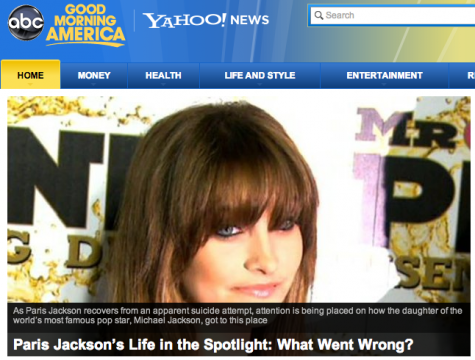 This is the front page at Good Morning America. This is news? What went wrong? Let me tell you what went wrong. Journalism went wrong. Having never been to J School I still have the authority to declare this a non-news story, a predatory practice and egg on the face of every news outlet from People Magazine to NPR. Americans have turned into cannibals, raising children just so that we can devour them as they ripen. Let me tell you what’s in today’s news (which is different than today’s headlines). The US government is secretly collecting the telephone records of millions of U.S. customers of Verizon under a top-secret court order, according to the chairwoman of the Senate Intelligence Committee. An Internal Revenue Service official at the center of the agency’s latest scandal told lawmakers Thursday that an expensive conference held in 2010 conformed to existing rules, though he acknowledged it was not the best use of taxpayer money. The official, Faris Fink, said spending at the $4.1 million gathering should have been more closely scrutinized, and that new rules would prevent such a conference today. The protests in Turkey that began over government plans to uproot trees in Istanbul’s main square to make way for a shopping mall have entered their seventh day. Austria announced it is withdrawing 377 U.N. peacekeepers from the Golan Heights after Syrian rebels briefly overran a crossing point near the border with Israel on Thursday, a development that has deepened concerns the civil war is spreading to neighboring countries. As a bulldozer began to clear away the debris of a collapsed building that killed six people in Philadelphia, city officials said a search for the dead and injured was nearly complete Thursday and an investigation had already begun to determine how a relatively commonplace demolition job could have gone so wrong. Esther Williams, the swimming champion turned actress who starred in glittering and aquatic Technicolor musicals of the 1940s and 1950s, has died. She was 91. Any of these would make spectacular headlines. If you’re wedded to leading with a pretty face by all means round up one of ABC’s zillion actors and talk about whatever it is they’re promoting. We get it. We understand these shows need a little celebrity. What is unconscionable is that every media outlet in the US is covering the mental illness and attempted suicide of a child. I don’t care if she’s in the spotlight. I don’t care that she’s an actor or a famous man’s child. I don’t care that she’s friends with Oprah or that she has a million twitter followers. There is nothing newsworthy about this. We have a child who needs help. If she had a broken leg and the press kicked her in the knee we’d send them to prison. At the moment she has an abundance of stress in her life either real or imagined and the press is piling on because they have antacid to sell. Every time we watch, share and participate in stories like these we are culpable. You are smart and engaged. I’m begging you to be still for just a moment and think about what 15 was for you. Forget that this is a celebrity child and think about being 15 and not having a dream for the future. Think about being so overwhelmed with whatever it was that terrified you and then think about what it is for that fear of the future to be stronger than the fear of pain and death. Every news anchor, every producer, every psychiatrist and talking head that goes on TV, radio or print to talk about this child is contributing to her misery. They might as well waltz into that hospital and help her plan more self destruction. I couldn’t bring myself to watch any of the segments. I will not force myself to read any of the drivel that’s written about this non-news event. That anyone dares to ask the question “What went wrong?” is offensive. Things go wrong. Things go wrong in public, things go wrong in private, things go wrong in reality and things go wrong in the fantasy world that teens and young adults have formed in their own minds. We’ve entered a dystopian age where journalists lead the charge and America answers their battle cry. Instead of tearing each other limb from limb we do it psyche by psyche. Your post is spot on, Jessica. I have lost all respect for ABC, GMA, George Stephanopoulos and ALL MSM news outlets covering this as “news”. It’s predatory, invasive and a whole host of other adjectives. That poor girl needs help, not dissection on national TV and online. This whole thing is just shameful. Thank you Jessica! It’s so sad. Until we all stop watching these shows they will keep it up. We need to hit them in the pocket book and maybe then the important news will be reported in an unbiased manner. I turned them all off in 2010 and I am happier for it. This. Thank you. I’ve been saying it for a long time that we need to get focus about what matters…and while this child matters, if she wants to go public with it that’s one thing. Until then, let’s pay attention to something that’s really news worthy. How did the story make it to the press? Is it leaked by someone at the hospital?